IDVisor Sentry - Customer Management System - IDScanner.com by TokenWorks, Inc. 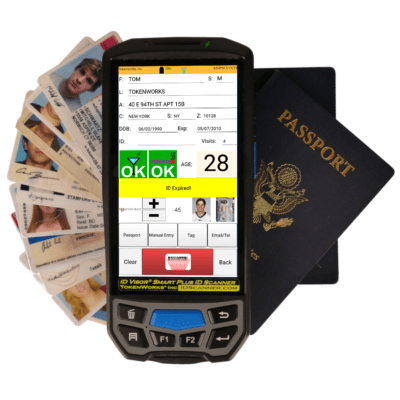 Captures drivers license data and images, manages membership, verifies age & more! The IDVisor Sentry makes capturing and maintaining detailed customer information simple and easy. When a customer’s ID is scanned for the first time, an account is automatically created using the data contained in the ID. 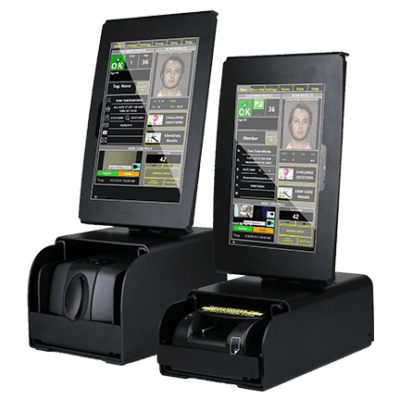 The system then calculates the age of the customer, verifies that the ID has not expired and automatically captures front and back images of the ID (CR5400 only). Membership tags can then be applied to the customer’s account with custom expiration dates. The system is also capable of automatically filling out any existing external forms in one step, eliminating time consuming manual entry and human errors. IDVisor Sentry is a Windows-Based Customer Management System with Age Verification & Membership Management. Reads Magnetic Stripes and 2D Bar Codes – All 50 states, Canadian provinces and US Military IDs. Image Capture – Captures Front and Back Images of Driver’s License. Capture Cardholder Image – Use any PC webcam to capture images of the client. Email & Telephone Capture – Manually capture customer contact information. Date/Time Stamped Transactions – Allows for synchronization with Video surveillance. Customer Visit counter – Identify New vs Loyal Repeat Customers. Membership – Easily manage customer memberships expiration dates. Banned List/Tagging System – Mark customers with custom tags: Banned, VIP, Member, Owes Money, etc. Anti-Passback – Detects re-scanned IDs. Helps prevent customers from entering with shared IDs. Form Filling – Automatically fill any existing form or application such as PDF, Excel/Word, Web Forms, etc. Create & Fill Custom Forms – Generate and save custom form templates. User-Defined Surveys/Questionnaires – Responses are saved in database and available for export. Badge Printer – With optional Dymo printer – prints Visitor Badges. Topaz Signature Pad Compatibility – Seamlessly utilizes Topaz signature pad accessory. Daily Reports – Able to generate daily reports via PDF files. Tutorial – Built-in help file included with system. Free Updates – Downloadable software updates available upon release. Custom software – Available for additional cost on request. Please contact us for more information. Credit Card Charge Back Protection for night clubs. Merchants who have to fight credit card charge backs will instantly see the value of obtaining additional proof to prove false claims of unauthorized use. Instead of capturing just a signature of the credit card holder on a 2” wide strip of thermal paper, capture a picture of their ID, a picture of them (via web camera), and a form acknowledging that they agree to pay for the products/services rendered. Clients of our IDWedgePro product love how it automatically fills in necessary business forms like rental agreements or medical forms often ask how they can save this data to better manage customer relationship. IDVisor Sentry meets both needs as it will auto fill a form if the cursor is flashing in that form while also saving name and address information to its local database in addition to images of the ID or person presenting the ID. Form filler solution scans drivers licenses, ID cards, credit cards and other magnetic striped cards and fills multiple computer forms with information from the card. It automatically recognizes and populates forms in multiple PC applications, allowing different applications to share the same ID scanner. It works with any PC application that accepts keyboard input.